Often referred to as wheelchair ramps, modular ramp systems are a more permanent solution for anyone with limited mobility, whether you use a cane, walker, wheelchair, or scooter. These ramps are customized to provide a safe, secure entrance to your home in CT, MA, MN, RI or WI. 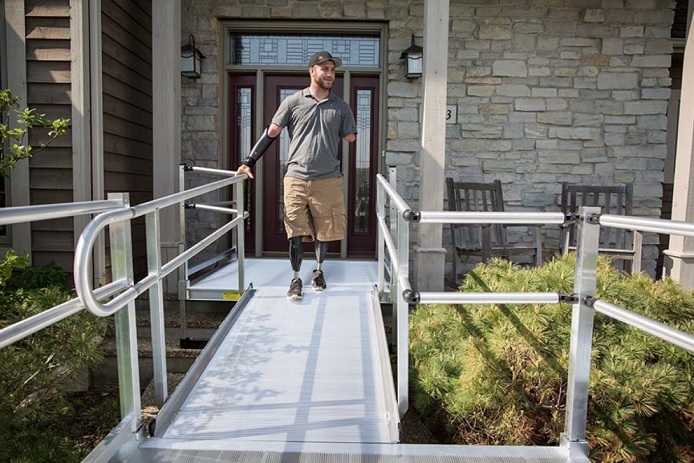 Safety is the number one priority for every modular ramp system Lifeway Mobility installs. After a free home assessment, we’ll design the slope and length of your ramp. Our experts will carefully consider your unique circumstances like the assistive device that will be used and whether the user will need assistance. We’ll also help identify the best location for your ramp, considering protection from the weather, privacy, and convenience. These details make the ramp safer and easier to navigate. Material: We offer durable, rust-free aluminum ramps. Texture: Our aluminum ramps come in solid or mesh options. Color: Aluminum ramps can be powder-coated in the color of your choice.